If your childhood dream was to live on Mars, you better submit your application quickly before it gets buried amongst hundreds of thousands of others. Mars One, a privately sponsored, “not for profit” initiative, funded by several philanthropic ‘space tourists,’ is currently seeking volunteers to be part of the first ever crew to inhabit the red planet. The first permanent settlement is scheduled to officially be up and running by 2023, so long as their approximate $6 billion in fundraising goes smoothly. However, before you submit a one minute video explaining why you are the most eligible candidate, you should probably take a few things into consideration. First of all, you must be 18 years of age or older, “intelligent, creative, psychologically stable and physically healthy,” and possess “the skills to solve any potential problem–some of which will be completely unforeseeable.” So that’s great! All this time I was under the impression that you would need a degree in science. Second, you need not apply if you’re camera shy, because the whole process will be filmed. From your application video beyond, your activities as a member of the first colony will be broadcasted across the entire Earth. That’s correct, the whole world will be watching as you sit…and then read…or….whatever it is you do to pass your time while confined to a space pod until you slowly go crazy and eat yourself. If you’re not so comfortable with the idea of being filmed, look on the bright side: all those friends and family you left behind for Martian real estate can dutifully watch you measure space dust…. and… watch plants grow… and stuff. Finally, you should prepare to be stuck in said pod with three strangers for the rest of your days, because the ticket is one way. Because of the high cost of transporting people and equipment to and from Mars, and to ensure that the settlement perseveres, a ‘Mars to Stay’ approach is being implemented with no tentative plans to bring the crew back. Don’t forget your copy of No Exit. Once you submit your video there will be an extensive televised selection process–a majority of which is determined by the audience’s vote. Each country will have their own competition, with 20-40 candidates from each being selected as final contestants. Each contestant will participate in challenges that test everything from their psychological disposition to their physical endurance. Those who make it past this round will compete amongst each other until whittled down to a compatible group of four. These groups of four will train together for several years before launching into space, living 3 months of each year in a simulation base. If one member drops out, which they are free to do up until launch, they will begin the training process over again with a new member. 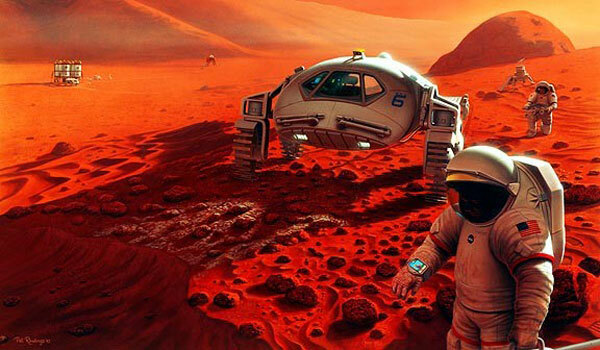 Whichever group is the most prepared by 2022 will be the lucky first to travel to mars. Before being sent to Mars you and your three new best friends for life will receive basic training to ensure that you are adequately prepared. During training each member will receive orientation in a specific skillset: 2 must be able to repair all equipment, 2 get medical training, 1 will be versed in geology, and 1 in exobiology. Every two years four more people will arrive, and the colony will continue to build and expand indefinitely, so long as funding for the effort remains stable. There are many dangers that the Mars One crews will face, most of which involve launching and landing. Mars takes approximately 7 months to get to and from, and during this flight the astronauts will face radiation exposure and run a high risk of developing osteoporosis from the significant bone and muscle loss derived from weightlessness. Once at the new colony, if any problems were to arise that needed an immediate response (space suits tearing, major equipment malfunctions, anything else “unforeseeable”), it will be impossible to send aid. Then again, Mars One makes it very clear that travelling to Mars is a high risk, citing early expeditions across the Atlantic and to the Antarctic as proof that humans are naturally curious and that no further ethical justification is necessary. Needless to say, Mars One is one small step for man, one huge leap for private enterprise. Mars one is a scam. Their plans do not make any sense and like other “mars colony”-plans they do much damage to the general space movement.